We’re enjoying a wonderful 5-night Caribbean cruise on the Disney Magic, our first Disney Cruise. We hope you’ve been following our journey through our website and Instagram account! Day two on our voyage was a full day at sea. On this day we took the time to really explore the Disney Magic and discovered some pretty amazing things about this first ship in the Disney fleet. Read on to catch all the details of our day and check out the amazing experiences that await your family on this awesome ocean voyage. After the hustle and bustle of our embarkation day, it was nice to have a full day at sea. Sea days are a great chance to explore and get your bearings along with enjoying everything the ship has to offer! Wondering if you’ll be bored on a Disney Cruise ship? Think again! There are non-stop activities and events. There is so much to see and do, you’ll never be without an opportunity to have fun, relax, and have great family time. As you might expect, Disney Cruise Line excels in their youth programming. We had the opportunity to tour the youth areas of the ship with Beth, the Manager of Youth Activities, to hear about Disney’s youth programs. Disney has five different youth clubs for various age ranges from small babies to seventeen-year-olds. Each space has a unique theme tied to a specific story for that specific area. For example, Vibe the space for 14-17-year old’s is modeled after a New York City loft. It’s so cool, and certainly, any teen would want to hang out there (oh to be young again). Disney has taken great care in designing and implementing their youth programming, and it was very impressive to hear about what goes into serving younger guests. We’ll have a full article on this topic coming soon, but just know that your kids are going to love these spaces and may not want to leave them! After touring the youth spaces, we were treated to the Art of the Theme Ship tour. Gus, a Cast Member from Argentina, did a fantastic job guiding us through the hour-long tour. It was a fascinating look at the various venues on the ship with an emphasis on design and artwork. We learned about how and why the imaginers chose the names, materials, colors, art, and more. We also learned some fascinating facts about the ship and how she came to be. For instance, the midship of deck five leading into the Atrium is a bit shorter in height to create forced perspective driving you to the grand central atrium, giving it the feeling that the space is much larger than it actually is. We learned so much, and if you ever get the chance to sail on the Disney Magic we recommend walking around the ship and noticing the detail that helps create the magical environment of the ship. A highlight in any cruise vacation is spending time on the pool deck. On deck 9 there are three pool areas. 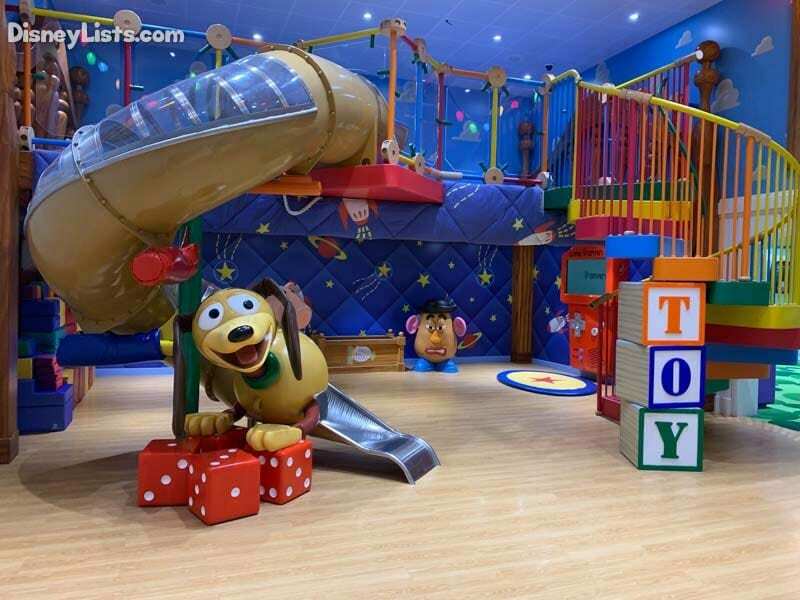 In the aft of the ship, you’ll find Aqua Lab, the kid’s pool area that includes the Nephew’s Splash Zone and the bottom of the Twist ‘n’ Spout water slide. Midship features Goofy’s Family Pool, which is a nice sized area for all ages. The Funnel Vision screen is in this area and features movies and show entertainment. Finally, in the forward section of the ship is the Quiet Cove Adult Pool for guests over the age of 18. This area is a nice quiet area away from the excitement of the family pool and is a nice place to relax. It is true that you’ll never go hungry on a cruise ship! There are so many fantastic dining options to be found all over the ship. Cabanas is a casual indoor/outdoor breakfast or lunch buffet-style dinner. Alternatively, in the evening you can sit down for a full-service dinner. On deck 9 in the pool area of the Disney Magic, you can enjoy three quick-service type restaurants: Daisy’s De-Lites, Duck-In Diner, and Pinocchio’s Pizzeria. Nearby you’ll find an endless supply of ice cream at Eye Scream. There are three main dining rooms that guests can visit during their voyage with Disney’s rotational dining: Lumiere’s, Animator’s Palate, and Rapunzel’s Royal Table. Each has a different theme. Finally, for a small upcharge, you can enjoy an absolutely fantastic meal at Palo. For more on Palo read on to #7 and be on the lookout for a future article going into more detail about the dining options on the Disney Magic. It should be no surprise to hear that you’ll find plenty of shopping options onboard the Disney Magic. Mickey’s Mainsail and White Caps are the two main gift shops that are similar to the shops you’ll find at Disney World Resorts. They feature exclusive Disney Cruise Line merchandise and other Disney merchandise. Sea Treasures was transformed into a Marvel store during our sailing. Finally, Shutters Photo Gallery and The Crown Jewelry round out the shopping options on the Magic. Note that DVC members do receive a 10% discount on their purchases at the Disney gift shops. After taking the afternoon to tour the ship thoroughly, we were able to enjoy a fantastic meal at Palo. Palo offers delicious Italian cuisine and outstanding Disney service for a small fee. Proper attire is required for this meal, but it’s so much fun to get dressed up for dinner on the high seas. We’ll have a full review article soon. For now, know that is was an incredible meal that we won’t soon forget. The service was impeccable, and we enjoyed every minute of it. We highly recommend this special meal for adults. It’s worth every single penny. After dinner, we headed straight to the Walt Disney Theater for the second of three Broadway-style shows during our voyage. On Day 2 we were treated to Tangled: The Musical. 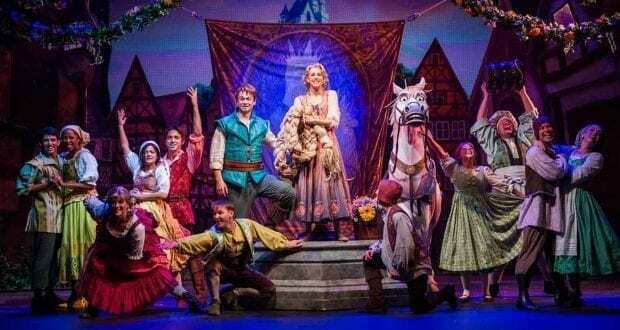 “Tangled: The Musical” is the newest original Disney Cruise Line stage spectacular. Presented exclusively aboard the Disney Magic, it’s the first-ever stage adaptation of the beloved animated film, “Tangled.” Combining a heartfelt story, an enchanting score, and lavish production numbers, the new musical showcases the thrilling adventure of Rapunzel and Flynn Rider as they face ruffians, thugs and a budding romance on an exhilarating journey of self-discovery. Disney assembled an all-star creative team to develop this lavish production. 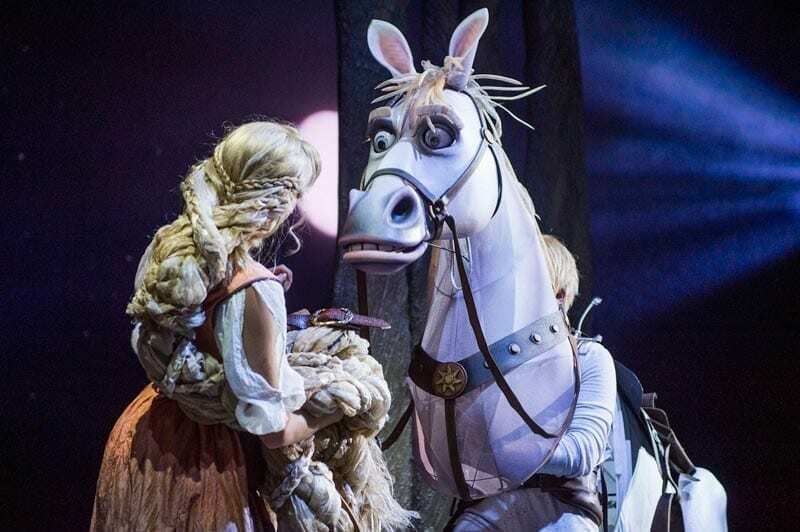 Academy Award-winning composer Alan Menken (“Tangled,” “The Little Mermaid”) and Grammy Award-winning lyricist Glenn Slater (“Tangled”) created three new songs exclusively for this show. Other top-notch theatrical talent included Tony Award-winning costume designer Paloma Young (“Peter and the Starcatcher”), master puppet designer Michael Curry (Disney’s “The Lion King” on Broadway), set designer Bradley Kaye (Disney’s “Aladdin—A Musical Spectacular”), director Gordon Greenberg and choreographer Connor Gallagher. “Tangled: The Musical” was produced by Walt Disney Imagineering Creative Entertainment. When you learn about the talent behind the show, you understand why we think the show was terrific. The group of actors who performed (the same group as the night before in Twice Charmed), were again top-notch giving incredible performances. For us, the “Mother/Witch” was just amazing. She stole the show and was absolutely perfect in her performance. Rapunzel’s story begins with a magical flower, but more than 200 physical flowers have been drawn, painted, carved, sewn and otherwise “planted” in scenic elements, costumes, and even Rapunzel’s hair. “Tangled: The Musical” features 15 scenes and seven locations. More than 40 scenic elements bring the fairytale locales of “Tangled: The Musical” to life. The 15-foot-tall tower features more than 20 glowing flowers hidden in a mural design. The mural in Rapunzel’s tower set piece was designed by Claire Keane, who created the original mural design for the animated “Tangled” film. Every set piece for “Tangled: The Musical” was sculpted and painted by hand. Tony Award-winning costume designer Paloma Young developed 125 costumes using more than 200 different types of fabrics. Rapunzel’s royal dress that appears in the show’s final scene is made of custom fabric developed especially for this show. The dazzling costumes are made complete with 85 pairs of shoes and 60 wigs. It takes more than 200 feet of hair to bring Rapunzel’s famous golden tresses to life onstage. Even after a long day, we wanted to check out some of the entertainment that is offered to adults in After Hours, Disney Cruise Line’s adult entertainment district. Keys, as the name suggests, is a piano bar that features some great musical entertainment. O’Gills Pub is, as you might guess, an Irish Pub that has plenty of TV’s to catch some sports during your cruise and a small nightly snack buffet featuring a number of cold and hot items. This day happened to be the night of the NCAA Football National Championship game between Clemson and Alabama, so we stopped in a while to watch the game (the good guys won). After that, we headed to Fathoms where we enjoyed a variety show by the group JunNk, whose fun, energetic music and comedy performance was definitely worth staying up for! We capped off the night at the Silent Dance Party. If you’re not familiar with silent dance parties, everyone is wearing headphones offering four different music options. Pick your music and start dancing. The room has all the energy of a club, but it’s completely silent. It’s hilarious to watch as well. If you think a Disney Cruise is just for kids, you’d be wrong. There is a steady stream of programming throughout the day for the 18+ crowd in addition to the nighttime adult entertainment district. There are so many things to see and do on the Disney Magic. We hope our ship tour day gives you a better idea of what she offers. Even though the Disney Magic is over twenty years old, she doesn’t show her age. Disney does an amazing job of making her sparkle and looks brand new. If we didn’t know better, it would be easy to think the ship launched in the last year. The Disney Magic simply looks amazing! Be sure to check out our highlighted Instagram Story from Day 2 by clicking here. You’ll see lots of photos and video from our second day at sea with a tour of the Disney Magic ship and our dinner at Palo!